…with no calendar, dammit, to tell them where they might be supposed to be, which is to assume anyone cares, which brings me back to the point which I have unfortunately forgotten since my braincells began deteriorating at page 5 and the deterioration deteriorated so rapidly that by page 48 I had turned into a brainless mumbling mono-celled organism condemned to spend eternity going round in an endless circle of rambling, barely punctuated, incomprehensibly-structured prose, an endless circle of destruction, leaving me feeling like a ghost inhabiting a land which unfortunately the destroyers didn’t destroy thoroughly enough or they would have wiped out Miss Coldfield, Mr Compson, Mr Sutpen and all their pesky descendants and left Mr Faulkner with nothing to go round in endless circles about, so that when at some time in the future or perhaps the past FF asked for recommendations for the Great American Novel Quest, no-one, not one person, not even a ghost, would have suggested torturing herself half to death reading a pretentious, repetitive, repetitive book, which is to literature much as WWE is to sport, with its major claim to fame being that it contains the longest grammatically correct sentence in the English language, thus getting into the Guinness Book of Records, surely more illustrious than the broken Nobel, though that record doesn’t specify intelligible, nor does it take account of the fact that Michael Chabon created a much longer, better constructed, and rather beautiful one in Telegraph Avenue, thus making this work even more redundant than it once was, this being the problem with all records, for who now remembers who held the record for the fastest mile before Roger Bannister broke the four-minute mark, itself a record now broken, but one that was at least exciting at the time, which I suggest this one wasn’t; and if they did, if some ghost drifting in the motes of dust circling round the room of the woman who is doing a particularly bad Miss ‘Avisham impersonation, in her room where she lives with the blinds drawn, angsting about a 50-year-old jilting, had whispered “Read Absalom! 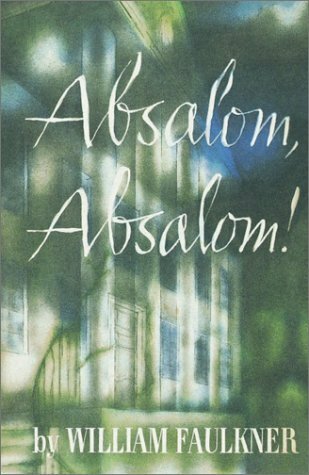 Absalom!”, then FF would have known to say “No’m!” – but too late, alas, too late! I’m at page 72. 240 to go. 🙂 Give up! So this will not be the GAN, then/ Now there’s a surprise! It’s a long time since I read this, but I think I quite enjoyed it – but then, I may just have come out from under “Eng.Lit” – with horrors like Middlemarch and Clarissa! I can’t give up in the middle of a paragraph though, so I’ll need to read at least the next 50 pages… 😉 Oh dear, I fear this is such an Eng. Lit. book – and we both know how will I got on with the English Department! Oh. My. Golly. This brings back so many memories. 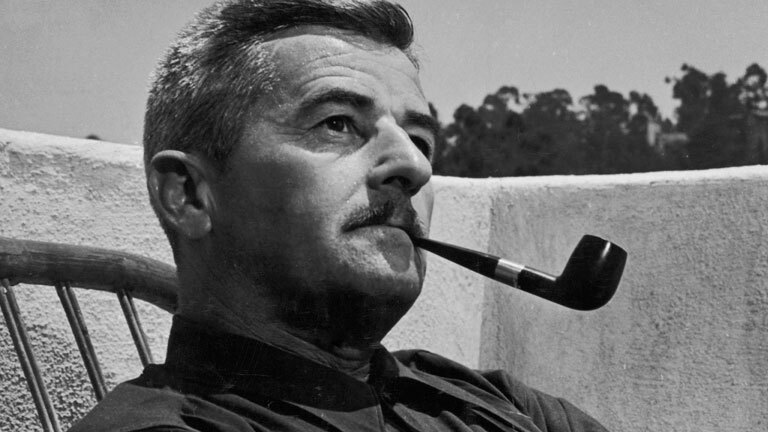 I went to college in Faulkner-country, and only through MANY blessings was I able to avoid having to read him (and I’m an English major…you’d have thought they’d have insisted). Anyway, I think you’ve suffered enough. Lent is over, my dear friend, and tennis season is upon us. NO WAY should you suffer more of this drivel! Pat yourself on the back for giving it a good go, then move on. You’re a brave lady for even trying to wade through this beast! I’ve sampled several of his short stories, and that was more than enough to convince me to stay FAR away from him. He must have been an interesting guy in his day, but his writing style…ugh, can you imagine diagramming one of his sentences??? I think you’ve captured the flavor of Faulkner! You are uniquely wonderful. I’m relieved I was never the one who suggested you should read this. Stop reading it. Have some chocolate. Have a glass of wine. Go dancing. Make yourself a cheese sandwich. 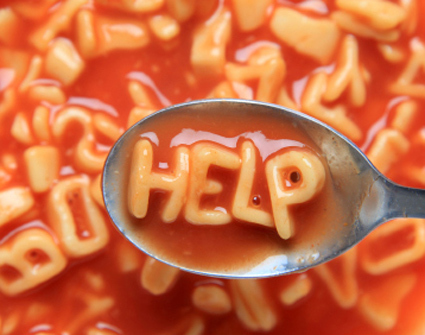 Find the alphabetti spaghetti letters which spell STOP. Desecrate the paper copy of the book if that is what you are reading. Sorry, that previous sentence was a little long. OR Locate copy on eReader. Click Delete item from device. Dance on a cheese sandwich. Pour glass of wine over chocolate. Contemplate all the many books you are longing to read. Pick one. Make a rude gesture to the shade of Faulkner’s book. Pour the wine and chocolate over the danced on cheese sandwich. Arrrrrrrrrrghhhhhhh! Not Ulysses! Never! Never, do you hear?!?!!! Oh dear, that’s what they all say….I’ll give up (the addiction) tomorrow, after the next….Faulkner sentence I can see you grimly struggling through – it’s like those people who have to climb the Munros, or who start out on a modest little 5k park fun run and then sooner than you can blink are forcing themselves to Ultra Marathons, the greater the agony, the greater the thrill. I’m afraid, if you stick with Faulkner, it’s not going to be enough, and you will inexorably be lured in by Ulysses. And the only place to go after that will be Ulysses……..translated into Mandarin! Love it! Deeply significant of….something. Time to throw the yarrow stalks to see what the I Ching has to say. Your tutor must have been humorless. Why Are You Reading This? Don’t waste another second – give in, abandon the book! Excellent advice above from Lady Fanciful. Dance on a cheese sandwich is my advice as well! Brilliant post – made me laugh out loud after a rather stressful afternoon. *laughing lots* So, my suggestion is to turn on a WWE match and watch it while you finish the book. You’ll remember it forever and ever and ever. Will be doubly epic. Have you even ever watched WWE? I’m not cranky! I’m just asking pointed questions, the sudden. Like a lawyer might do, or something like that. *laughs* The reason I asked was…’cause I’ve never probably watched more than five minutes, haha. *laughs* Uh-huh! Five minutes is about enough, I reckon! I’d much rather watch real sport, but at least nowadays they admit it’s fake – they used to pretend it was genuine. Oh, FF! I cannot stop laughing! I am ROFLing and ROFLing. You are brilliant! This is one of my all-time favorite books, but perhaps it’s because I read it with one of those aforementioned (and frequently mentioned) academics. My teacher was a poet and a Faulkner *expert*, so my experience was definitely shaped by my guide. It took over my dreams, partially because the entire book has the quality of a dream/nightmare.The horror of entrenched prejudice that was (and in some parts, still is) the South was quite fascinating, how it destroyed families. How it pitted fathers against sons. That it was more acceptable to marry your sister than for a white person to marry someone who was 1/8th African American. That the old lady and the dust motes are all stand-ins for the old South, for antiquated bigotry. Quentin’s inability to deal with his ambivalence toward the South and his own heritage leads to further tragedy. I would not recommend that you read The Sound and the Fury. Perhaps you would like Faulkner’s short stories better. There are quite a few that do employ a significant amount of punctuation. I could recommend other Faulkner novels, but perhaps I should just side with those who are telling you to throw in the towel and head for higher ground…. 😀 You are such a good sport. And the darkness of that stifling parlor, the hidden family secrets and those of the South that were never aired. Oh my, the memories come flooding back. Can you believe I read that book three times over the course of two weeks, as required for the class? Are you shuddering? Do you need to go lie down? Or maybe you need to go read some Hemingway to clear the Faulkner out of your system? The thing is that I do see everything you say about it – there is a good story in there, some of the imagery is great and so far at any rate it is insightful about the whole post-Civil War trauma of certain sections of the South. It’s just that the writing style is soooo awful! I genuinely believe that if a survey were done of all the people on Goodreads who’ve 5-starred it, 99.9% of them probably were ‘taught’ it rather than just picking it up and discovering it for themselves. There’s such a huge gulf between what academia thinks is good writing (the more difficult to decipher the better) and what most people look for in a book – clarity! Pah! Good! Glad to hear it! Now go read something that you’ll tempt me into adding to my pile. But not Hemingway. I’ve never been able to stomach his machismo. How about William Trevor? *narrows eyes suspicously* Does William Trevor write in proper sentences?? I’ve thought of a plot for a new horror novel… a mad scientist digs up Woolf and Faulkner, mixes their DNA, and releases the resultant monster on an unsuspecting world… aaaarghhhhhh!!!! You did WHAT? O dear. Wait a minute and I will bring in some wine to refresh brain. Alas. I knew FF well…. Stop reading, life is too short. Best review ever though. I would love to help but just reading the post has made me want to lie in a darkened room. I think the fact you are as far in as you are is a minor miracle. Give up now whilst you have a chance! Haha! Thank you – you have no idea how hard it was to get the ellipses to fall in just the right place… 😉 Most of the GAN recommendatons have been brilliant, but one or two… well, let’s just say they’re not to my taste! Oh, god, did I tell you about a former student of mine, whom I called Hawkingway? He was in a fiction writing class I was teaching. The goal was to get students to write a variety of stories and end with a portfolio of three polished pieces. This student, regardless of the exercise given, would basically rewrite a story about being alone on the sea. He felt the only two writers worth EVER reading were Hemingway and Faulkner. Quite a rigid young man! During workshops he would tell other students how to make their stories more like H or F when the writer clearly had no intention of writing such a story. I took to calling him Faulkingway in secret. Your review made me laugh out loud! Ha ha! That’s my usual response to Faulkner! He was required reading in college. Sound and Fury, Light in August–arrrrrggggghhhh! Stop reading, FF! Life is too short! Haha! It has been duly abandoned!